The biggest x86 launch for AMD in five years is today: Ryzen is here. As always before a major launch, AMD gives a ‘Tech Day’ for relevant press and analysts, and through this event AMD’s CEO, Dr. Lisa Su lifted the lid on one of the most anticipated products in the semiconductor industry. AMD knows how to control the level of enthusiasm for its fans, and today is the end result, with processors going on pre-order from major retailers today at 1pm EST, ready for a general hard launch on March 2nd. In a similar vein to launches of recent smartphones, AMD is doing a staggered announcement/launch with the products on their new microarchitecture. Where Samsung/Apple might give all the details for a product a few weeks before it’s available to buy, today on February 22nd marks the day where AMD is giving consumers information about Ryzen, and specifically the Ryzen 7 family of eight-core products. All the information today is from AMD, and AMD’s internal testing, and pre-orders also start from today for users ready to put down their money for a launch day part. Reviews of the CPUs, as well as when the CPUs will ship to customers, is on March 2nd. This also happens to be right in the middle of two annual shows, Game Developer Conference (GDC) and Mobile World Congress (MWC), making the time between receiving pre-launch samples and being able to provide independent verification of AMD’s performance claims relatively frantic. We’ll do our best! With a new processor launch, naming the parts and positioning them within the market is critical. So with Ryzen, the processor stack will be split into three based on performance and price: Ryzen 7 at the high end, Ryzen 5 in the middle, and Ryzen 3 for more price-conscious consumers. Both Ryzen 5 and Ryzen 3 are set to be launched later, and Ryzen 7 is the first portion of the family to be released. Ryzen 7 1800X will be the high-end part, featuring a base clock of 3.6 GHz and a turbo of 4.0 GHz, within a TDP of 95W, and for $499. Next to this is Ryzen 7 1700X, launching at $399, with a base/turbo of 3.4/3.8 GHz. The final part for the launch is the Ryzen 7 1700, providing eight cores and sixteen threads for $329 at 3.0/3.7 GHz frequencies. Processors will initially be available for pre-order from 185 retailers and OEMs worldwide, either as individual parts or pre-built systems. What, not 40% IPC? 52% IPC?? Enthusiasts and analysts use the term IPC, or ‘Instructions Per Clock’, as a measure of how much the underlying microarchitecture improves from generation to generation. Two decades ago, a good design on a smaller node could net a healthy double-digit gain, whereas in recent years 5-10% gain has become the norm. When AMD initially announced that the new Zen microarchitecture they were developing was aiming for a 40% IPC gain, despite the low IPC they were starting from, users remained skeptical. AMD rehired Jim Keller to work alongside long-term AMD architect Mike Clark and produce a team with several goals in mind: high-performance x86, simultaneous multithreading, and a product to be relevant in the computing, PC, server and mobile space again. So despite this, 40% IPC always seemed a somewhat lofty goal, because Bulldozer was so underwhelming, and despite this low starting point. For the Ryzen launch today, AMD is stating that the final result of that goal is a 52% gain in IPC. This is something we will need to test in due course! AMD pointed out that the new 8-core silicon design runs 4.8 billion transistors and features 200m of wiring. Through previous announcements we’ve examined parts of the microarchitecture including cache sizes, threading, front-end/back-end design, and so on. AMD’s CEO was keen to point out that this is a from-scratch design for AMD, using the knowledge gained from features developed for previous products but ultimately under the hood it looks like ‘a typical x86 high-performance core’, with AMD-specific features and tweaks. We were told that AMD’s roadmap extends into the multi-year range, so while the focus for 2017 will be on this family of products, back at HQ the next two generations are in various stages of development. So despite the 82+ motherboards going to be available, 19 initial PC system builders moving into 200+ through the first half of 2017, the big question on everyone’s lips is how exactly does it perform? 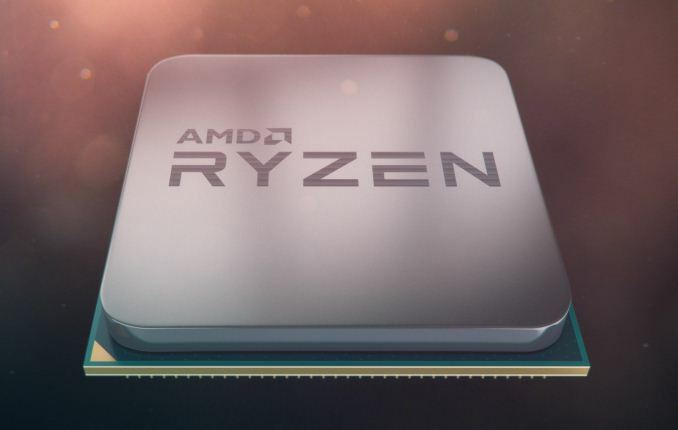 AMD's benchmarks showed that the top Ryzen 7 1800X, compared to the 8-core Intel Core i7-6900K, both at out-of-the-box frequencies, gives an identical score on the single threaded test and a +9% in the multi-threaded test. AMD put this down to the way their multi-threading works over the Intel design. Also, the fact that the 1800X is half of the price of the i7-6900K. In a similar vein, again with the Cinebench 15 multi-threaded test, the Ryzen 7 1700X scores over and above the Core i7-6800K (its price competition) and higher than the Core i7-6900K which costs 2.5 times as much. We’ll tell you what our benchmarks say, with official retail processors. But you will have to wait until March 2nd. Sorry. Dude you can't even spell "guess" correctly.